Having been an avid collector and admirer of artist bears, and being of an artistic nature, I decided in the year 2001, to buy a kit and have a go!. The result I thought at the time was wonderful, and I was totally hooked ! ! !. 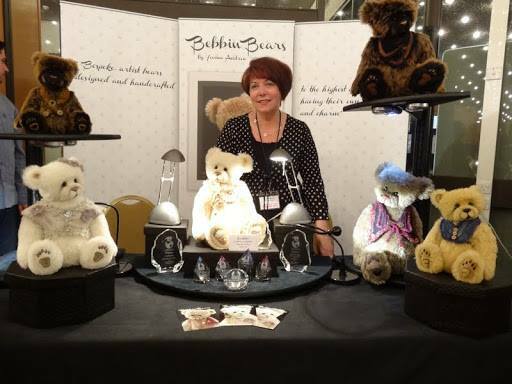 I moved on swiftly into designing and making my own style of bears, which were soon snapped up by family, friends and now….. collectors! I am a perfectionist, so my main priority is to produce a bear that is made with great care, and attention to detail. I spend many hours working on a bears head to create an appealing character filled face, and move on only when I am entirely satisfied. All my bears are individually designed, so each having a different and unique personality. I make only one bear a week, depending on size, and most have special hand-embroidered paw and footpads, which although very time consuming, I think add to the overall quality of the bear ….. just something a little different….making them very distinctive, and instantly recognizable …….as a Bebbin Bear! 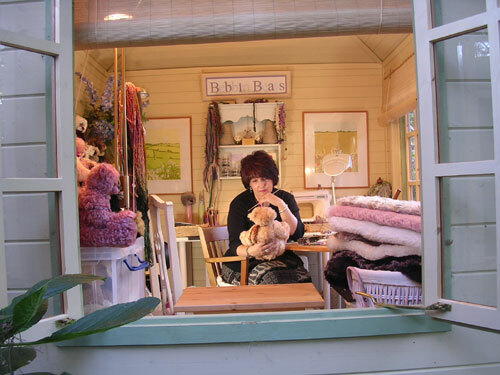 Each bear is crafted from the finest quality Mohair or Alpaca, all have glass eyes, cotter pin or nut and bolt joints. Most are filled with fibre, glass beads and steel shot, ( the latter always in cotton bags) for added weight. All my bears are created in a smoke-free environment, and are completely handmade and embellished by myself. Each bear has a hand embroidered nose. They also have a sew in label and swing tag containing all details Please note that all the bears have been created for the adult collector, and should not be given to children.